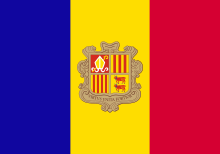 Andorra competed at the 1992 Summer Olympics in Barcelona, Spain. Eight competitors, seven men and one woman, took part in five events in five sports. Three male cyclists represented Andorra in 1992. ^ "Andorra at the 1992 Summer Games". Sports Reference. Retrieved 19 July 2016. This page was last edited on 27 March 2018, at 23:30 (UTC).